Hillside is a neighborhood in the City of Milwaukee. It was named after World War II for the homes that were built literally on the hillside that forms the neighborhood. Its boundaries are traditionally defined as Walnut Street to the north, Fond du Lac Avenue/McKinley Avenue to the south, Interstate 43 to the west, and Dr. Martin Luther King Drive (formerly North Third Street) to the east. The City of Milwaukee, however, recognizes the area east of Sixth Street as a separate neighborhood called Haymarket and extends Hillside’s northern boundary all the way through Halyard Park. This entry uses the former definition. The neighborhood’s first settlers, almost all of whom were German, arrived in the 1850s. The Uihleins, who owned the Schlitz Brewery on Third Street, were the most prominent family, and the neighborhood picked up the nickname “Uihlein Hill.” Other local enterprises included a hay market at the foot of the hill at Fifth and Vliet Streets, as well as cigar factories, shoe factories, butcher shops, blacksmith shops, and bakeries. Working-class housing was mixed with upper-class housing. Eastern European Jews settled on the hill by 1900. Golda Meir, a future prime minister of Israel, was eight years old when she and her parents moved into an apartment on Sixth and Walnut. She attended Fourth Street School, which was renamed to honor her in 1979. The area around Uihlein Hill was also Milwaukee’s first neighborhood to have substantial numbers of African Americans. As working class people earned more money, they moved to other, outlying neighborhoods, and the Hill transitioned to a high-poverty area. The Housing Authority of the City of Milwaukee cleared two blocks in the late 1940s and replaced the old dilapidated homes with a public housing project called Hillside Terrace. The City built more than six hundred housing units between 1948 and 1956. Housing varied from one-bedroom apartments to five-bedroom rowhouses. The Redevelopment Authority of the City of Milwaukee continued to clear houses between Sixth and Tenth Streets in the 1960s and built the Mayflower Court, Plymouth Manor, and Walnut Park public housing projects. Former Milwaukee Public Schools superintendent Howard Fuller and NBA basketball player Freddie Brown grew up in these housing projects. The Hillside neighborhood has developed in a number of other ways since the 1970s. The Hillside Community Center (or Hillside Family Center) opened in 1978 and provides a variety of social and medical services. Additional services are provided through the Boys & Girls Clubs of Greater Milwaukee. 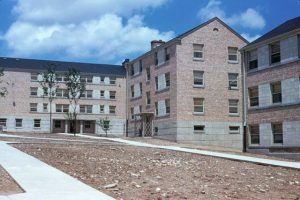 Hillside was the recipient of a $46 million refurbishment in the 1990s that improved building interiors and enlarged porches and green space. 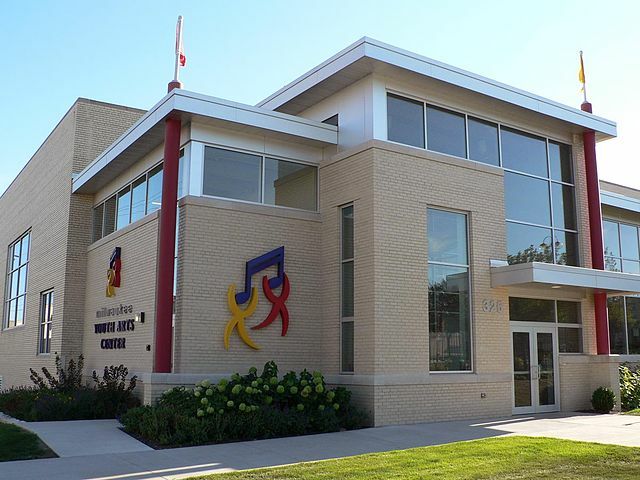 The Milwaukee Youth Arts Center opened at Third and Walnut in 2005. The Schlitz complex no longer brews beer, but has been converted to other uses. For example, Milwaukee Public Schools operate a middle school in the renovated bottle house of the Schlitz Brewery in the 1990s, but closed it in 2010. Golda Meir School, which offers a gifted and talented program, relocated its middle school program to the former Schlitz building in 2012 and began a high school program in 2014. ^ John Gurda, Milwaukee: City of Neighborhoods (Milwaukee: Historic Milwaukee, Inc., 2015), 187. ^ City of Milwaukee, “Milwaukee Neighborhoods,” May 2000, http://milwaukee.gov/ImageLibrary/Public/ map4.pdf, last accessed December 21, 2015. ^ “History,” Golda Meir Gifted and Talented School website, last accessed December 23, 2015; Gurda, 189; and Milwaukee Board of School Directors, Proceedings of the Board of School Directors (Milwaukee: The Board of School Directors), January 9 and 11, 1979. ^ Joe William Trotter Jr., Black Milwaukee: The Making of an Industrial Proletariat, 1915-45, 2nd ed. (Urbana, IL: University of Illinois Press, 2007), 24-25. ^ Gurda, Milwaukee, 190-193; D.M. Hiska, Proposal for the Development of Plymouth Hill: Hillside Neighborhood Redevelopment Project UR-WIS 1–2 Milwaukee Redevelopment Authority, Milwaukee: Milwaukee Redevelopment Authority, [1962?]. ^ Community Block Grant Administration, City of Milwaukee Neighborhood Strategic Plans for CBGA Planning Area 13 (Milwaukee: City of Milwaukee, 1996); Gurda, Milwaukee, 192. ^ Jeanette Minson, “A New Home for Creativity,” Milwaukee Journal Sentinel, January 24, 2005; Mary Louise Schumacher, “Argosy to Give $500,000 to Arts Center,” Milwaukee Journal Sentinel, January 9, 2005. ^ Alan Borsuk, “MPS Middle School Shuffle Progresses,” Milwaukee Journal Sentinel, February 23, 2008; Proceedings of the Board of School Directors, August 22, 1990 and May 27, 2010. ^ Proceedings of the Board of School Directors, December 13, 2011; Erin Richards, “5 Reasons to Be Optimistic about Milwaukee Schools,” Milwaukee Journal Sentinel, September 17, 2014. Community Block Grant Administration. City of Milwaukee Neighborhood Strategic Plans for CBGA Planning Area 13. Milwaukee: City of Milwaukee, 1996. Gurda, John. Milwaukee: City of Neighborhoods. Milwaukee: Historic Milwaukee, Inc., 2015. Hiska, D.M. Proposal for the Development of Plymouth Hill: Hillside Neighborhood Redevelopment Project UR-WIS 1–2 Milwaukee: Milwaukee Redevelopment Authority, [1962?]. Trotter, Joe William, Jr. Black Milwaukee: The Making of an Industrial Proletariat, 1915-45. 2nd ed. Urbana, IL: University of Illinois Press, 2007.